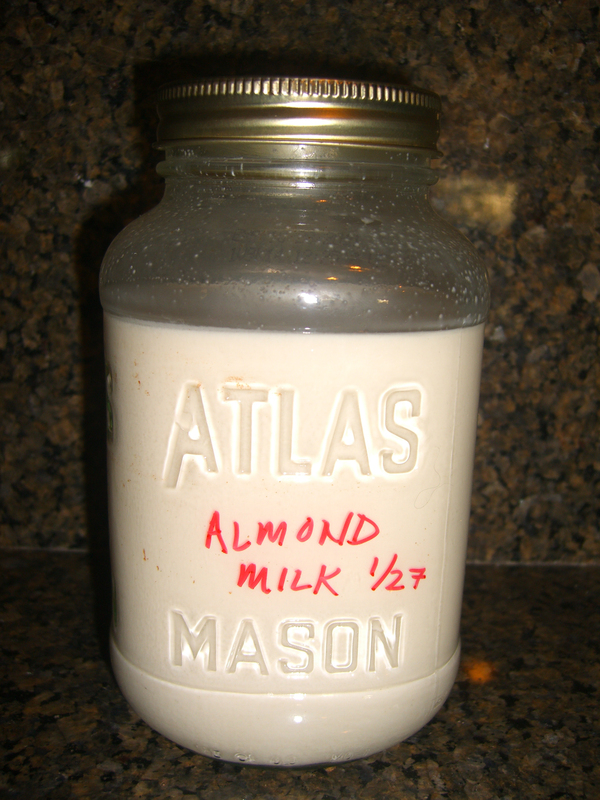 Homemade almond milk is sooooooo creamy and NOTHING like the almond milk you buy in the store. 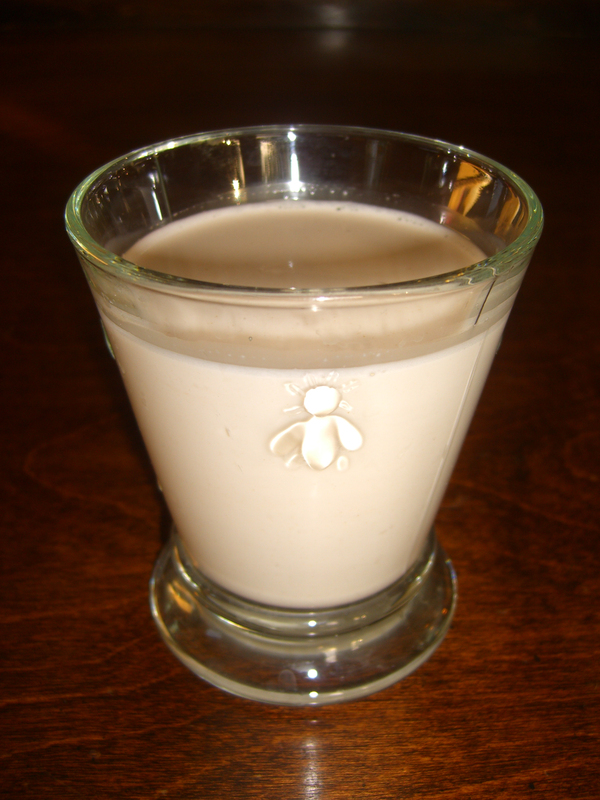 Today I made some plain almond milk and when my son came home from school I used it to make him strawberry almond milk, which is one of his favorites. 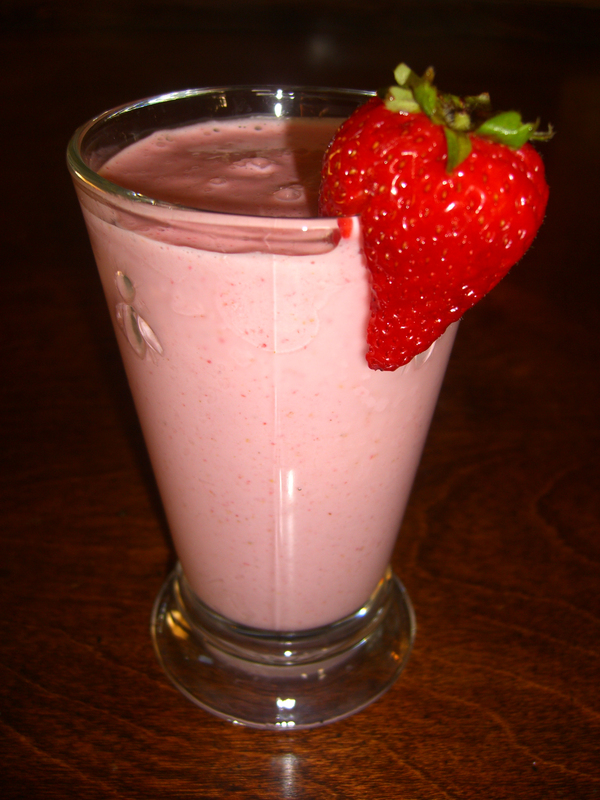 As we were sitting around the kitchen island drinking the strawberry milk, I mentioned that I was going to post my recipe for plain almond milk and my husband told me that I NEEDED to post my recipe for the strawberry milk as well (he was literally telling me this while drinking the tiny amount of strawberry milk that was left straight out of the blender container). I hope you enjoy the strawberry milk as much as we do! 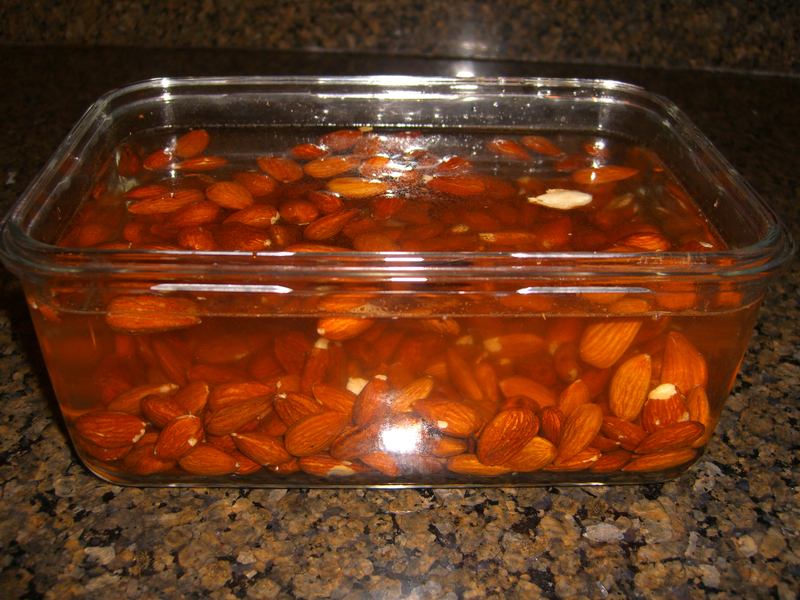 Place the raw almonds in a container and fill the container with filtered water. Place the container in the fridge overnight to soak. NOTE: The almond milk can be made without soaking the almonds, but I strongly suggest that you do. 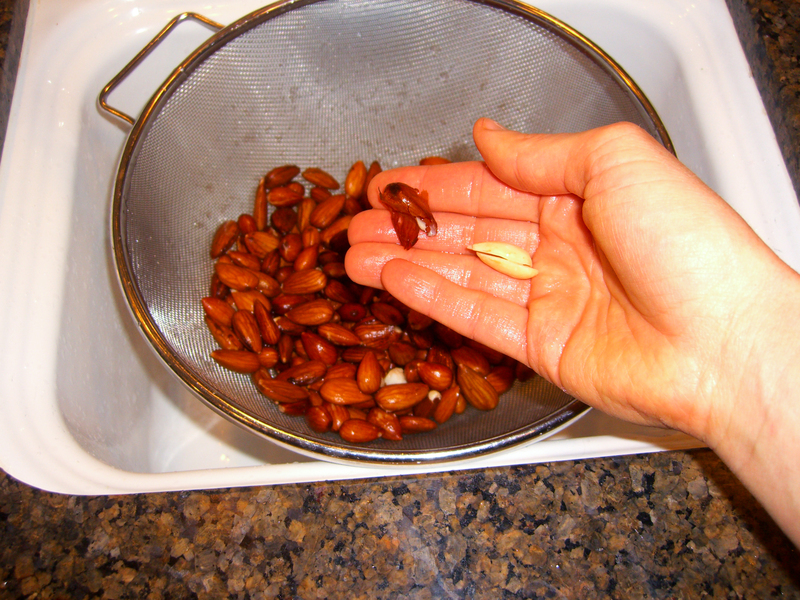 Soaking the nuts will make the milk more creamy, but the main reason you want to soak the nuts is to destroy the enzyme inhibitor. Nuts were created with an enzyme inhibitor that prevents them from prematurely sprouting. This inhibitor also makes it hard for many people to digest nuts well. 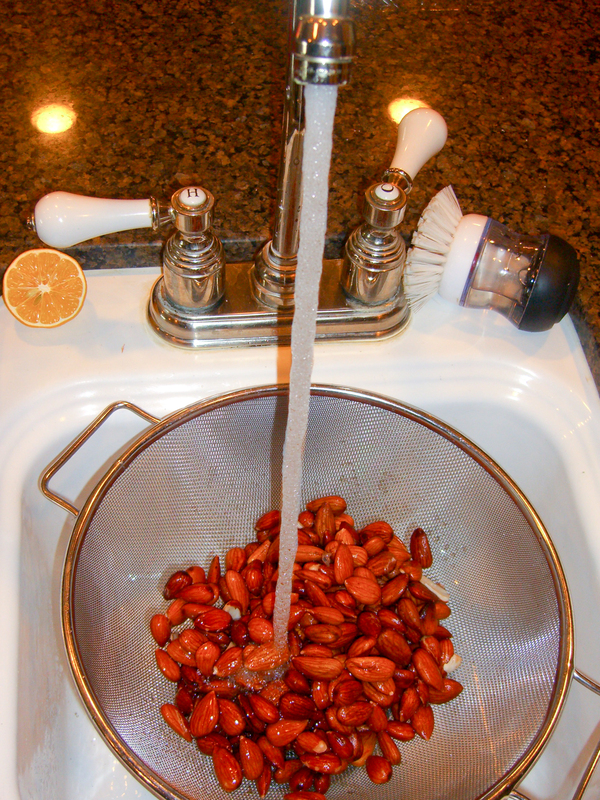 When you take the time to soak the nuts, the inhibitor is neutralized and the enzymes come to life…per my earlier post enzymes are very beneficial to us. 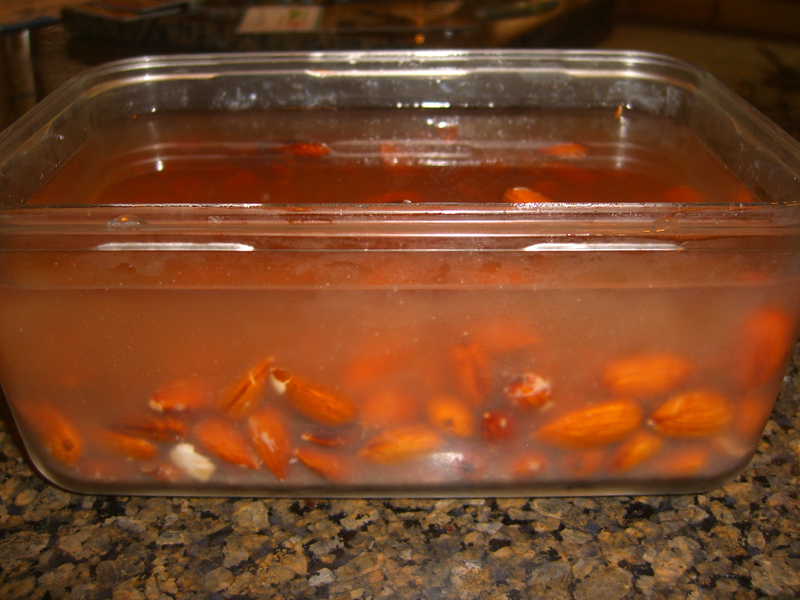 Rinse the soaked almonds under cold water. At this point you may remove the almond skins if you’d like. I personally don’t mind the skins and keep them on when I make my milk. 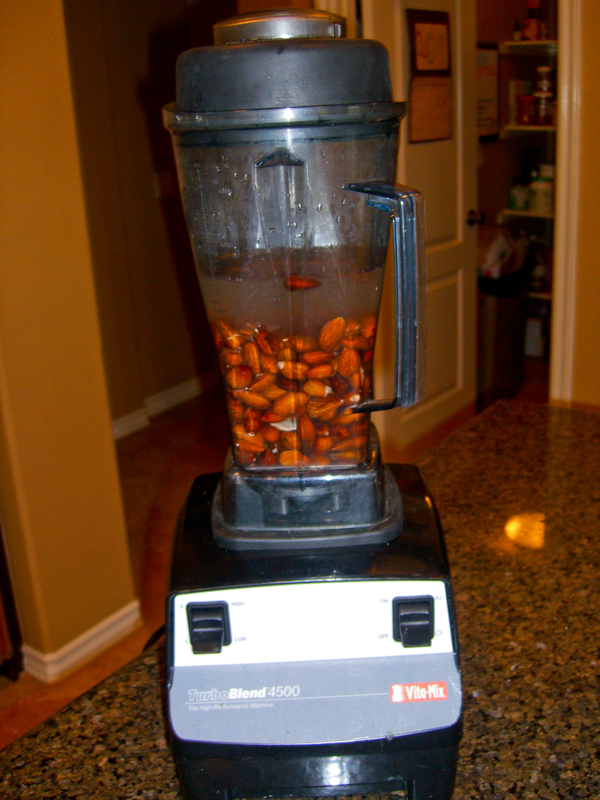 Place the clean soaked almonds in your Vitamix or blender with 4 cups of filtered water and blend until smooth (2-3 minutes). 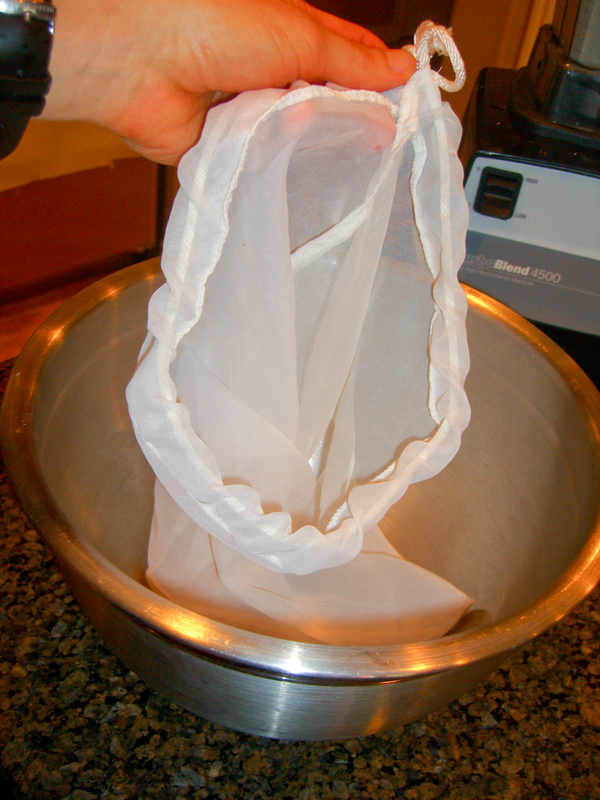 Put the nut milk bag into a large bowl. 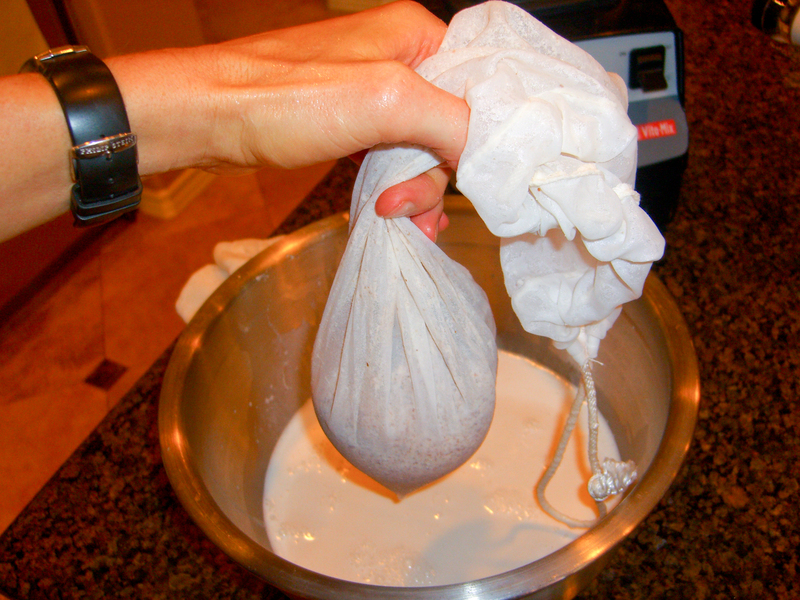 Pour the almond mixture into the nut milk bag and squeeze the liquid into the bowl. 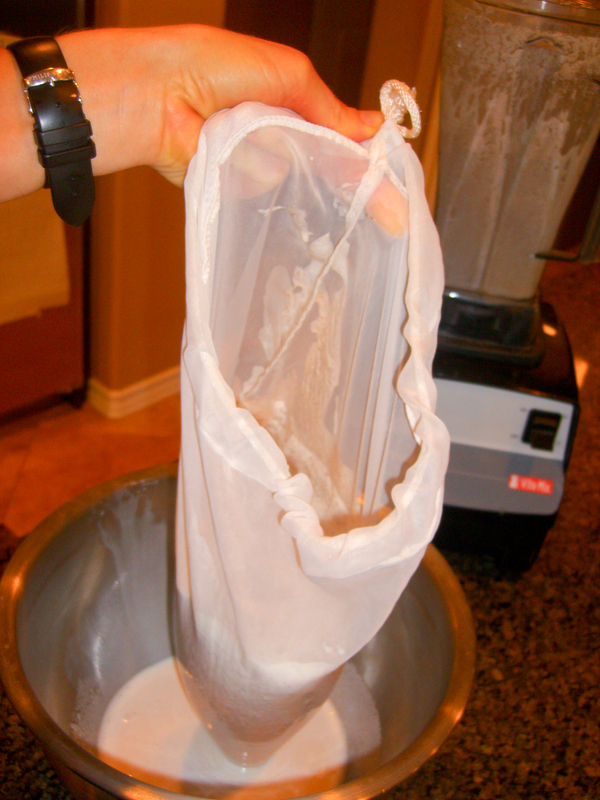 Once all of the liquid is out of the bag your plain almond milk is complete. 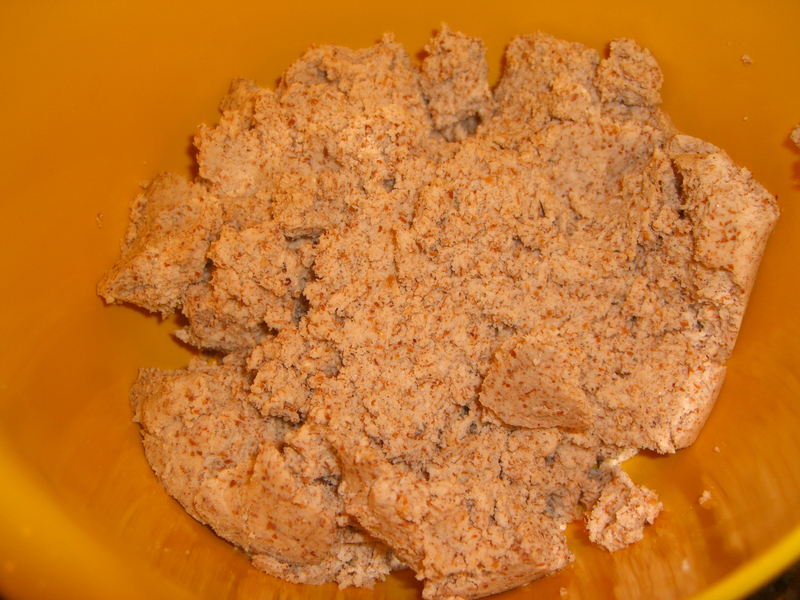 Reserve the nut pulp for another recipe. 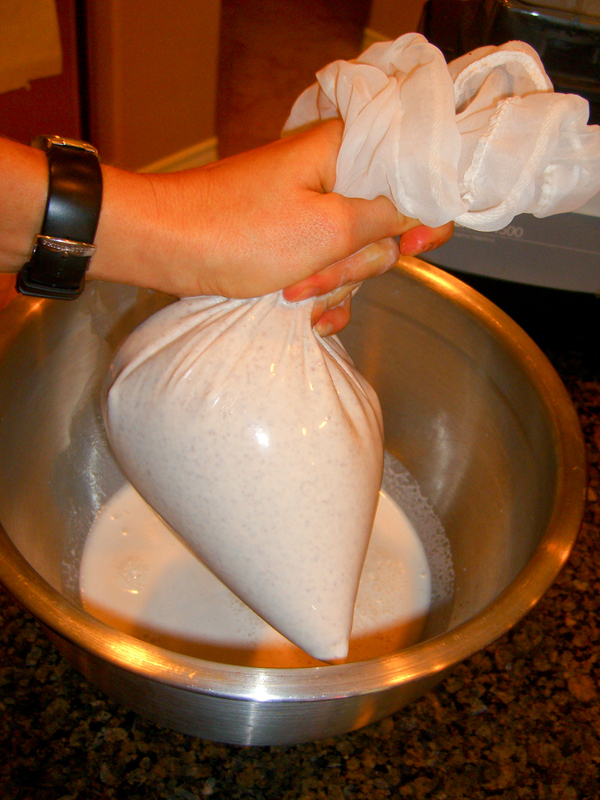 I put my pulp in a bag and lay it flat in the freezer until I am ready to use it in a recipe. The plain almond milk is now complete. I prefer to store the almond milk in the fridge in its plain state (great with cereal)…that way I can embellish however I’d like. Rinse out your blender. 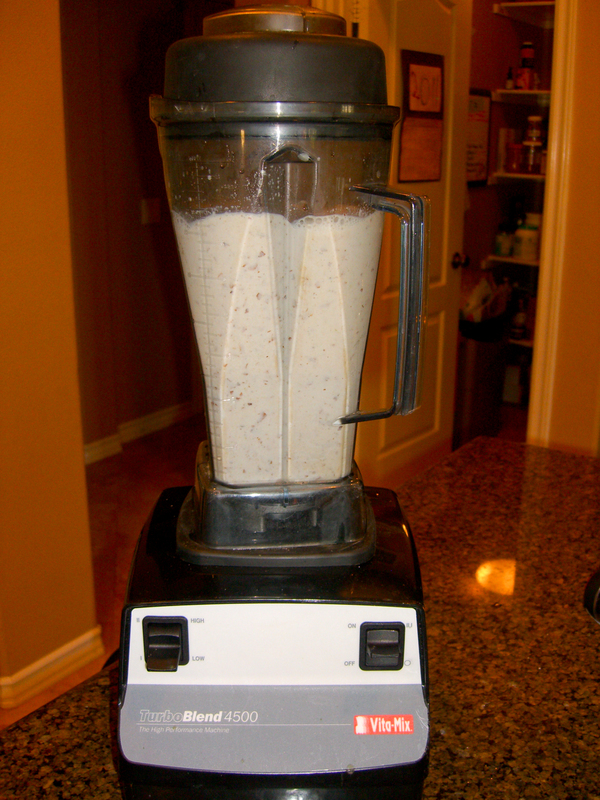 Pour 1 cup of the plain almond milk into the blender. Start the blender and add the frozen strawberries one at a time through the opening in the lid. Blend until smooth. Add the agave syrup and blend again. Taste the strawberry milk and add more sweetener if needed. Drink immediately as this is when the flavor is best. It will not store well, so it is best to make it in small batches that you will drink right away. Yum that looks fabulous I cant wait to try the strawberry version. what do you use the almond pulp for? I use it for lots of different things… to make nut cheese, as a base for raw cookies or scones that I make in my dehydrator, or I add it to my pancakes and granola… we don’t want to waste all that good fiber! That looks delicious and so easy! I’ll definitely have to try that. I am *so* going to do this. I can’t wait! Welcome to my site! I just checked out your site and really liked it! yummy, this looks so good! Very good recipe, absolutely loved it- I will be sharing this link with like minded friends- Thank You! almond milk: do you discard the soaking liquid or use it in the blender? Happy Friday to you too! I LOVE dates and add them to my shakes too…I bet they tasted great in the almond milk.